Birthdays are a time for…humiliation? Birthdays when you’re single may be cause for frustration in North America — especially if one’s parents are particularly determined to see their offspring happily paired off. Nevertheless, we don’t make as big a deal of the single status on birthdays as some other countries around the world. In Germany, according to Mental Floss, bachelors receive “sockencranz” on their 25th birthday. This means any German guy will be treated to a wreath of socks outside his home if he’s unmarried after a quarter of a century’s worth of opportunities to resolve this imbalance. The old socks are meant to represent old age. That’s disappointingly obvious for my taste. I’d been hoping it might represent a now-dated (let’s hope) belief he was unable to wash his own socks and was stinking up the neighborhood (unless he lived at home with his mother). 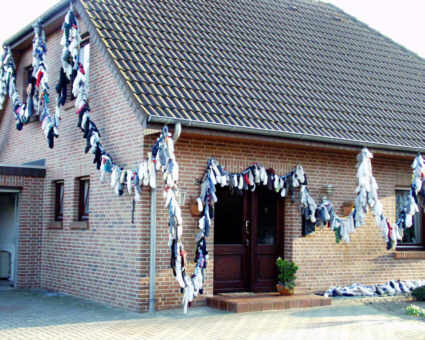 Anyway, a search of sockencranz on Google nets a link to a #sockenkranz on instagram that clearly depicts women celebrating 25 with strings of socks too. Actually, many of the images have women or men and shot glasses…so alcohol seems to be involved as well (in a astoundingly rare showing of a culture incorporating liquor into its celebratory traditions). • Dutch who mark the “crown years” of 5, 10, 15, 20 and…uhm 21…with bigger presents. But back to the public humiliation of the unmarried — in Denmark, the Danes who live to be 30 and unmarried wake up to what’s called a pepper person. These are often huge representations of men or women made out of oil drums. Because nothing says “Happy Birthday, we love you” like a little singleton shaming, right?